Titleist 915H 2 hybrid with stiff flex Diamana S 7 Shaft and Golf Pride Grip. Golf Pride MCC Plus 4 Grip in Grey and Black - Excellent condition. TITLEIST 818H Hybrid. Titleist Factory order via PGA Professional. Titleist 818 H1 hybrid -19 degree (14g neutral weight). Used condition - see photos for condition. Titleist 915H Hybrid, 18 Degree, Mitsubishi Rayon Diamana Stiff Flex, Golf Pride Multi compound. 2 years old, owned from new, well looked after and in very good condition. Matching Driver and 3 Wood also for sale, will except sensible offers for all 3. Titleist 913 H Hybrid in very good used condition. It has a moderate amount of ball strike marking to the face and minor scratching to the sole, but no sky marks or dents. It is right handed, 19 degree loft and standard length. It comes with a Stiff Diamana Blue (70) Shaft and stock Titleist branded tour velvet grip which is in fantastic condition, and the original head cover, also in very good condition. It has the SureFit system for loft and lie adjustment and I will set it to the standard A1 position. These hybrids are a second hand club and show signs of wear on the face and sole of the golf club. SHAFT - Diamana 82g HY Stiff. These clubs have been used but not abused. They will show normal wear from frequent play and may have natural scratches, pop up marks and/or bag wear on the shaft. Upgraded superior stiff Diamana D White 92g Shaft. Titleist 818 H1 Hybrid 19 deg. includes headcover and the draw/fade weight as well as the neutral weight which is fitted. Head, shaft, sole all perfect, a couple of marks on the face through normal use, but nothing major or anything that effects performance. Titleist 913H 19 Hybrid - Aldila RIP Phenom Stiff Shaft, Very good Condition. 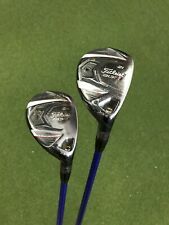 Titleist 2019 Hybrid 818H2 17* Project X EvenFlow Black 85HY 6.0 Stiff Mint! Titleist 2019 Hybrid 818H2 17 degree with Project X EvenFlow Black 85HY 6.0 Stiff in mint condition! titleist hybrid 818 H2 17 Degrees. Diamana White X Stiff. Condition is Used. I purchased this on a golf trip we my gear didn’t arrive. Titleist 816H1 21 Degree Hybrid Upgraded Tour Spec S Flex Shaft. Condition is Used. Dispatched with eBay delivery – Shutl 1 day. TITLEIST 913 H HYBRID 21 DEGREE Stiff Diamana s 82 Used condition. See pics for condition Probably needs a new grip. Titleist 585 Hybrid. Fitted With Titleist Golf Pride Tour Velvet Grip. Aldila NV 85 Gram Stiff Graphite Shaft. SOLD BY A PGA PRO. IT DOES SHOW SIGNS OF USE AND WEAR THROUGHOUT. Regular Mitshubushi Rayon Diamana shaft. Titleist 913 H hybrid. 21 degrees but adjustable. Small chip on top of club at toe end- see photos- easily painted in if required. Headcover included. Titleist 585 19 degree hybrid, stiff shaft, very good golf pride half cord grip, usual use on club face, no scuffs on top, head cover not in great condition. Titleist 816 H2 Hybrid 19° Tour AD UT95 X Flex. The club is used but in good condition, it has a fantastic shaft in it. There is a small mark from an alignment rod on the crown, I’ve tried to show it in the photos. It’s barely visible. Thanks! Condition is Used. Dispatched with eBay delivery – Shutl. The Titleist H2 hybrid play more like an iron than a fairway wood. The stiff shaft has a Midsize 4plus Grey grip fitted. The regular shaft (unused) has a standard size grip fitted. titleist hybrid 816 H1 19 Degrees. Diamana Blue Stiff. Condition is Used. It comes with a head cover. I purchased this on a golf trip we my gear didn’t arrive. Used condition but still loads of left left! The club face is decent, some light marks but no dings or dents. The head has some marks but nothing major. Shaft is fine, no bag rub marks. The grip has plenty of life left. See pics for more details. Any questions please ask! Men’s Titleist hybrid golf club. The club is USED but in GOOD condition. Slight usage and scuff marks. Shaft is graphite and stuff shaft. Grip is in GOOD condition. Please message to ask me any questions you may have. Willing to post and accept cash on collection. Tensei White Stiff Flex Graphite Shaft. Left Handed Titleist 818 H2 21° Hybrid. TAKE DEAD AIM: The 818 hybrids from Titleist introduce the SureFit CG which along the SureFit Hosel allows for maximum shot-shape customization. 10% off with code PRO10. T&C's apply - UK only. It has a Diamana Hybrid Shaft in Stiff flex. This makes the club most suitable for a player with a faster than average swing speed. Second Hand Titleist 816 H1 Hybrid. This is a 23 degree hybrid. H1 - SCORING. It has a Fubuki Hybrid Shaft in Stiff flex. This makes the club most suitable for a player with a faster than average swing speed. Second Hand Titleist 816 H1 Hybrid. This is a 21 degree hybrid. H1 - SCORING. Shaft Diamana S 70. Titleist 915 H 21 Degree 3 Hybrid. Grip Titleist Golf Pride M580. Flex Stiff Shaft. Head: 6 - Fair Shaft: 6 - Fair Grip: 7 - Good. Club Type 3 Hybrid. Loft 21 Degree. Shaft Material Graphite. The stiff shaft is a Project X Even Flow 6.0 S 85 gram HY. It has the head cover and weight still in its original wrappers too! Titleist 816 H2 Hybrid. (All photos are of the actual club being sold). Condition Details. Reference: HYBTITLEIST21. Wrench Included: NO. 21 degree loftUsed Ex hire Titleist 818 H2 Hybrid Club. Fitted with Tensei Blue 70 Stiff flex graphite shaft. Diamana S 70 Stiff Flex. Titleist 915H #3 Hybrid. Right Handed. Head cover: NOT Included. Length: 40". (All photos are of the actual club being sold). Grip: Mid Size Golf Pride Tour Wrap White. Get in Touch. Shaft Flex - Stiff (S). Loft - 17 Degree. Shaft - Diamna 'ilima 70. Head Condition - 5 Well Used. Head cover - No Cover. Grip - Titleist M580. Shaft Flex - Stiff (S). Loft - 21 Degree. Head Condition - 6.5 Good. Head cover -Yes/Matching. ADJUSTABLE LOFT AND WEIGHT. ROGUE MAX 85 STIFF SHAFT. HEADCONDITION 9.75/10. EXCELLENT CONDITION. another great deal from golfbuyit. TOUR VELVET GOLF PRIDE GRIP.